Fra diavolo translates to “brother devil.” It’s an old-school Italian sauce that didn’t originate in Italy. It was actually created at a restaurant in Little Italy, New York in the early 20th century. Lobster was the seafood of choice for the original recipe, but the luxury crustacean is expensive and sometimes not readily available. Shrimp is an excellent substitute that won’t break the bank, and it’s available at most supermarkets. The flavor of the sauce is deepened by the addition of a secret ingredient that might seem a little scary at first. But don’t be afraid to add the anchovies. The tiny salt-water fish make all the difference in the sauce without leaving a fishy taste. Trust me. The anchovies deepen the flavor and elof the dish and elevate it from everyday to gourmet. 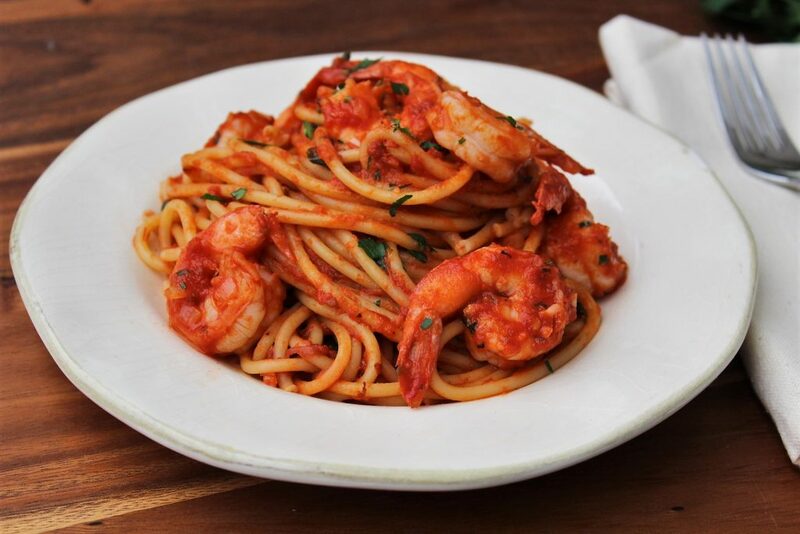 Shrimp fra diavolo is a simple sauce that jazzes up everyday pasta. It’s also the perfect dish to celebrate the holiday season. The sauce is a little naughty and a little nice thanks to the spicy and sweet flavor of red pepper flakes and jumbo shrimp. Heat 2 tablespoons oil in a large skillet over medium-high heat. Season the shrimp with salt and pepper and add half the shrimp to the skillet. Cook the shrimp until pink but not cook through, about 1 minute on each side. Transfer to a bowl and repeat with the remaining shrimp. Add the remaining 2 tablespoons olive oil to the skillet, then add the shallots, garlic, anchovies and red pepper flakes. Cook until the shallots and garlic are tender, about 1 minute, stirring constantly. Add the tomatoes, wine, butter, sugar, oregano, 3/4 teaspoon salt and ½ teaspoon pepper. Bring to a simmer, reduce heat and cook, partially covered until thickened, about 15 minutes, stirring occasionally. Meanwhile, bring a pot of salted water to a boil. Add the pasta and cook according to package directions. Reserve 1/2 cup cooking liquid, then drain the pasta. Add the reserved pasta water, parsley, basil, pasta and shrimp to the sauce along with any collected juices from the bowl and toss to combine. Season to taste with salt and pepper if necessary. Serve immediately. 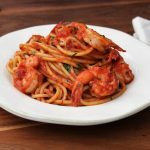 This entry was posted in Dinner, Entree, Italian, Pasta, Recipes, Seafood and tagged bucatini, fra diavolo, pasta, shrimp on December 12, 2016 by Andria Gaskins.